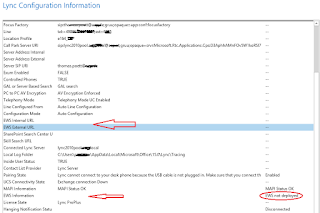 Lync 2013 requires several additional software to be installed and has the need of certain roles and features, as well as hotfixes. Since I'm missing a scripted PowerShell installation, segregated into Lync 2013 roles, I decided writing this detailed Blog, based on Microsoft Technet article and experiences. It shows you all requirements and prerequisites for each Lync Server Roles and all supported Operating Systems. As a common question; Which prerequisites do we have if I need the Administrative tools only. You simply can consider the Administrative Tools as a server role, therefor you need the same prerequisites as listed in the common section for "All Server Roles required". Regarding the Visual C++ Runtime: Best is you install this component by ONLY using the installation media. Microsoft C++ 2012 x64 Runtime - 11.0.50727 if you try installing any other version, you will run into an issue. Check my blog article about this issue here. NOTE: Install this Hotfix only after IIS Components are installed! Remember, with Windows Server 2008 R2 you need to import the Server Manager module first. Do not install any Winsock Layered Service Providers (LSP) software, on any Front End Servers or stand-alone Mediation Servers. Installing this software could cause poor media traffic performance. Is there any reason, why your powershell command for 2012 server does not contain windows-identity-foundation ? well normally, you should activate Identity Foundation via the Server Manager before you install the other requirements. Generally you can add it into the script, it doesn't matter. Thanks for providing this blog post. I just installed Director servers for the first time. The Director prerequisite script for Server 2012 (and 2008 too I believe) is missing the component Web-Dyn-Compression. Thomas good article! Just one thing there needs to be a space on the director script at the -Source portion. Hi Tope, well it needs the "All Server roles require" pre-reg. hope this helps you.